Choosing a birthday party game for kids is a topic every parent faces each year. This page is designed to help choose some games that are popular with children. Some ideas for selecting a birthday party game for kids. •	Indoor or outdoor – Some games must be played outside due to the space requirements. Other more sedentary games may be played inside. •	Age Appropriate – The game should match the maturity level of the participants. The game “Duck Duck Goose” may not go over well with a group of 10 year old boys. •	Also, some games require a certain degree of skill and coordination that may not be suitable for younger children. •	Theme Related – If the birthday party has a pirate theme, you may want to choose games that would match the theme. Many birthday party game for kids below can be adapted to various themes. •	Involvement – Get the birthday child involved in helping to choose the games for his or her party. They’ll know which games the other children will enjoy the most. •	Equipment – Some games may be bought, others can be made or need just basic supplies. This should all be done in advance, to avoid last-minute stress. •	Time – You’ll need to know how much time you want to allow for the birthday party games for kids. Some games may be over in five minutes, other games may take much longer. So, if the average game lasts ten minutes, and you want to allocate one hour for all the games, that means you’ll have to come up with a list of ten to twelve games. •	Every Child Wins – It’s often best to award “consolation prizes” or “participation prizes” to those who do not win, especially for younger children. The consolation prize may be as simple as a small toy or piece of candy. This is one of the most well-known outdoor children’s game. The kids pair up and are tied at their ankles with rope. They must then walk “three legged” toward the finish line. It is recommended to use a soft nylon rope, and tie it somewhat loosely around the ankles. This old time favorite is still popular. 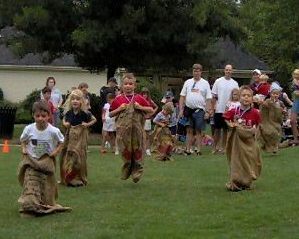 Children line up, with both feet in sacks, and hop toward the finish line. To make the game last longer, you may want to have the children hop towards and object they must go around, and then hop back. Younger children may need assistance from their parents or older siblings. When looking for potato sacks I discovered that potatoes now come shipped in boxes and the sacks are no longer made. Coffee does come in sacks, and they are identical to potato sacks. Old pillow cases may be substituted as well. In this game the participants choose partners and one crouches down while the other jumps over him or her. Then they switch and they continue towards the finish line. It’s best if the partners are equally-sized. Participants tie a balloon around their ankles with a rubber band or piece of string. On the "GO" signal, each player attempts to pop other player's balloons while protecting their own. Players may not use their hands or body to push off other players. Players with popped balloons can sit on the side and watch, or fill up more balloons for another game. The winner will be the one left who has not had his balloon stomped. One child is chosen to be “Simon”, and the children must obey the commands only when “Simon Says”. When Simon does not say “Simon Says” and anyone follows that command, they are out. The last child left is the winner. This birthday party game for kids is best played outdoors, for obvious reasons. Small balloons are filled up with water, and partners are chosen. The partners face each other in two lines. The balloons are then tossed upon command. When a water balloon breaks both partners are out. The last remaining partners win. Each child is given an egg and a spoon. We recommend wooden spoons and Styrofoam eggs. The children line up, and must then put one hand behind their back. If the egg drops they are allowed to stop and pick it up. First one over the finish line with his or her egg on the spoon wins. This game is usually one of the last games played, and is one of the most popular birthday party game for kids. Two teams are chosen, of equal size and strength. They each takes sides holding a rope facing each other. When the referee yells “GO”, they each try to pull in the direction of their team. One inch or one and a half inch rope is recommended. Birthday Party Game for Kids - Since 1985 Funtastic Events has offered the best entertainment and amusement rentals. 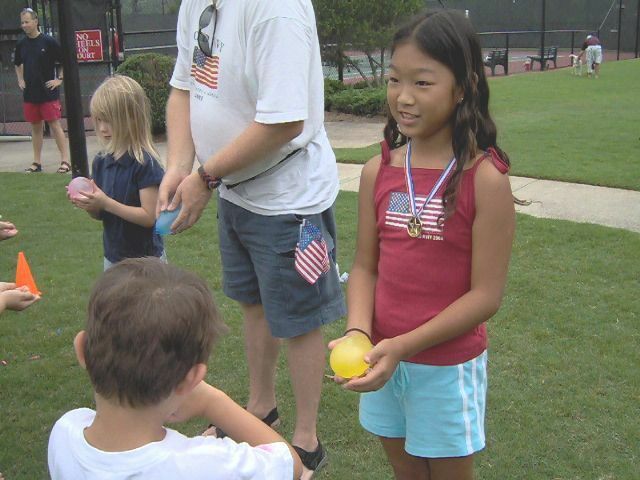 We’ve been responsible for birthday party games for kids for over 20 years. We are not just another entertainment company, we are entertainers ourselves.